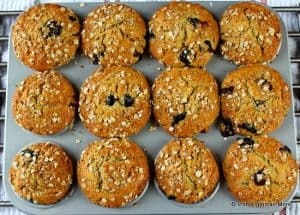 Muffins are my favorite, easy, grab-and-go breakfast at the weekend. I love to whip up a batch on Friday evening, to make sure I get a head start on Saturday morning mayhem, which usually reigns supreme in our house. When we wake up on Saturdays, we’ve usually hit that snooze button a few times too often, and immediately have to start running here, there and everywhere around the house looking for football boots, water bottles, basketballs, shin guards, tin whistles, and all the other paraphernalia four kids need for matches and activities. With blueberry muffins ready to go, at least I know breakfast is covered. “What’s for breakfast, mom?” echoes through the house every Saturday. “Grab a muffin,” I shout back. And grab a few muffins we surely do. I pack some in a plastic lunchbox, and as I sit on the sideline of some sports field, I treat myself to a muffin. Well, maybe a muffin or two. 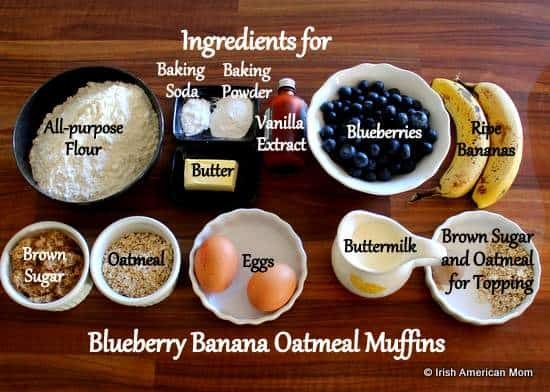 And so, here’s my recipe for Saturday morning muffins. 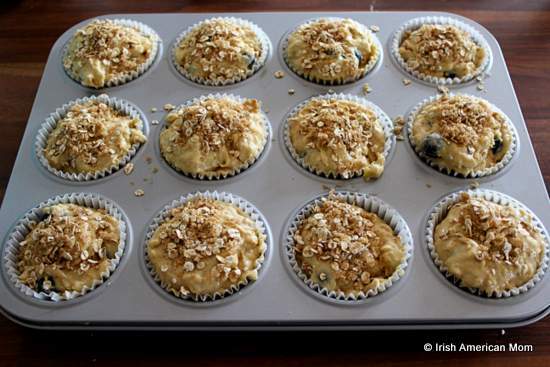 I know muffins are not typically Irish, but I add some good Irish oatmeal to these blueberry-banana muffins, which definitely gives them an Irish twist. Before you get started mixing the muffins, let’s do a little preparation. Turn the oven on to 350° Fahrenheit to make sure you have a nice hot oven for the muffins once they’re mixed. 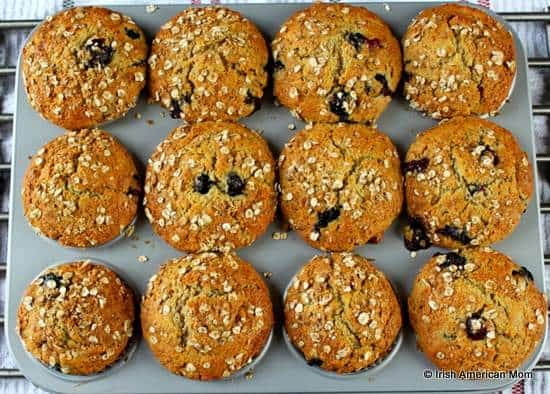 Since these muffins rise based on the chemical reaction between buttermilk and baking soda, it’s important to get them into the oven quickly once they’re mixed. So be sure to line a muffin tray at the very beginning. Next sift the flour, baking power and baking soda together. Add a pinch of salt if you wish, but I don’t bother. I use melted, salted butter for this recipe, so I think they’re fine without any extra salt. If you substitute oil for the butter, then add a pinch of salt. 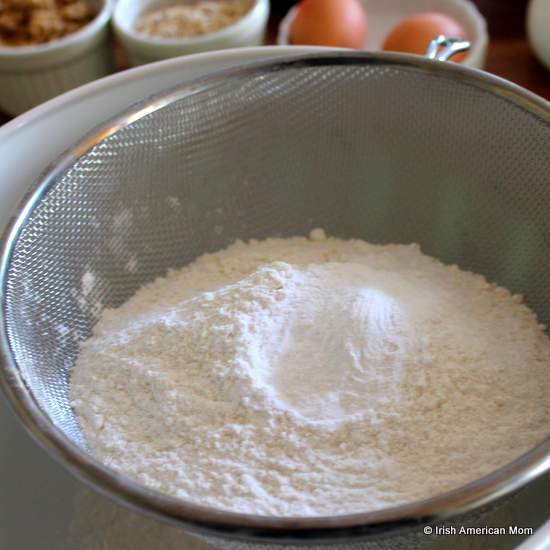 If you don’t want to bother sifting, then mix the flour with a whisk to eliminate lumps. I just can’t bring myself to eliminate the sifting step. I still hear my high school home economics teacher lecturing on the importance of incorporating air into the flour by sifting. Next add the brown sugar and oatmeal to the mixing bowl and combine them with the flour. In a separate bowl or pitcher add the buttermilk and eggs and whisk them together. Melt the butter and add it to the eggs and buttermilk. Next come the bananas. Mash them with a fork on a plate. Give them a good old mashing. I don’t like banana lumps in these muffins. 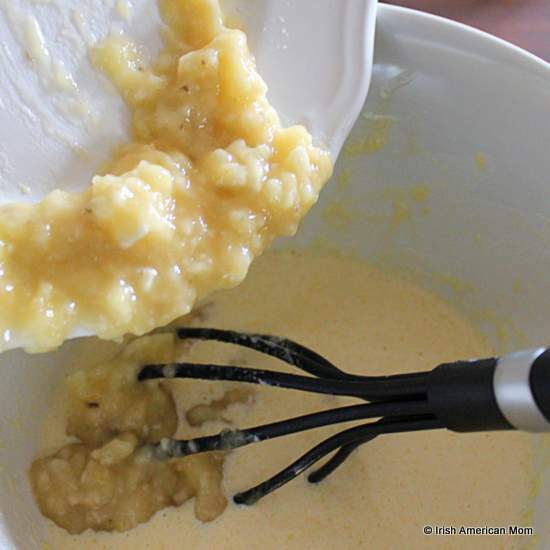 Another trick of mine is to add the mashed banana to the wet ingredients and whisk them together. Others may add the bananas after combining the wet and dry ingredients, but I like to add them to the eggs first. Next step involves pouring the wet ingredients into the dry. Make a well in the middle of the dry ingredients, and pour in the buttermilk mixture. Combine the batter gently. It may seem a little lumpy but don’t worry about this once there aren’t any pockets of dry flour. 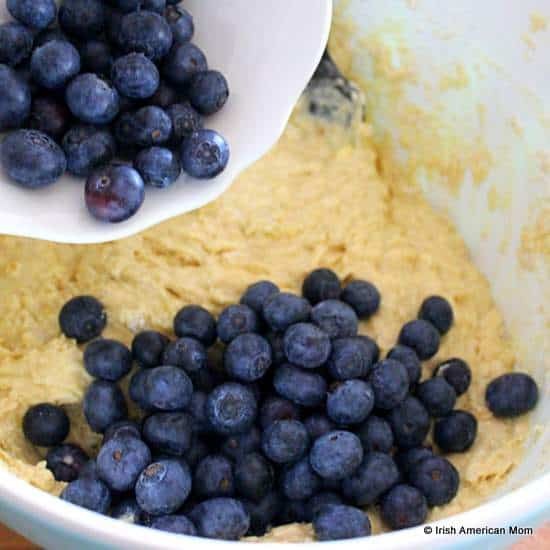 Toss in the blueberries and mix them gently through the batter with a spoon. And this is how the batter looks when it’s ready to fill those muffin cups. 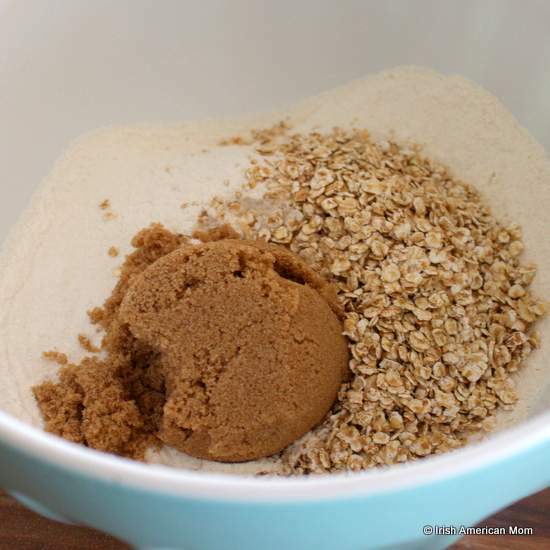 I mix the topping next, which is simply a combo of brown sugar and Irish oatmeal. Divide the batter between the twelve muffin cups. The baking cases will be pretty full, but I like a muffin with a nice big muffin top, so I just load them on up. 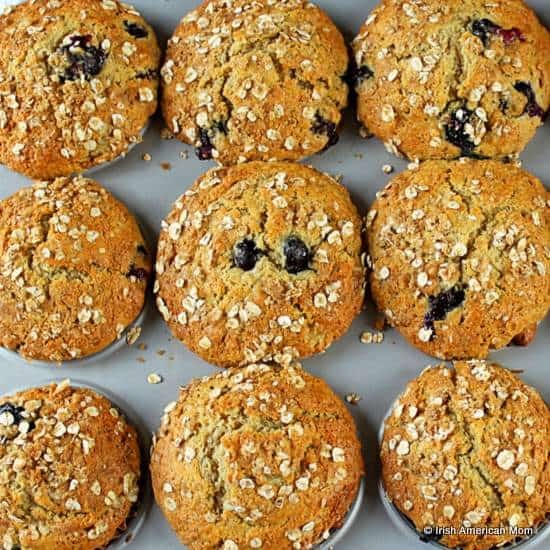 Nothing wrong with an extra big muffin top – take it from me. 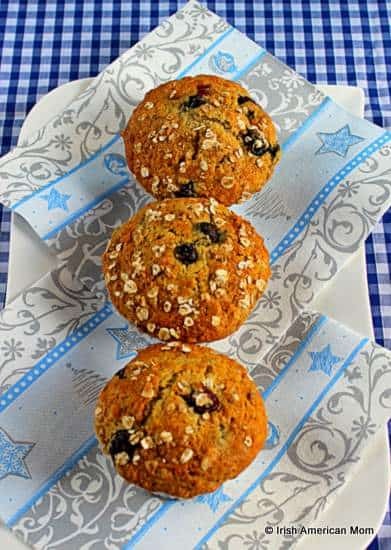 Sprinkle the top of the muffins with the sugar and oatmeal topping. Next pop them in the pre-heated oven, and bake them for 18 to 20 minutes. When ready they’ll be beautifully golden brown. Remove them from the oven. Allow them to sit in the tray for about 5 minutes to cool slightly. Then transfer them to a wire rack to cool completely. Then, if like me you make them the evening before you really and truly need them to feed four hungry kids, try not to dig in straight away. It’s very hard to resist. But if you have to, just crack one open while they’re still a little warm and enjoy those juicy blueberries surrounded by moist and fluffy muffin. Yummy! A blueberry muffin and a cuppa tea is the perfect Friday evening supper when all the kids are tucked up in bed. 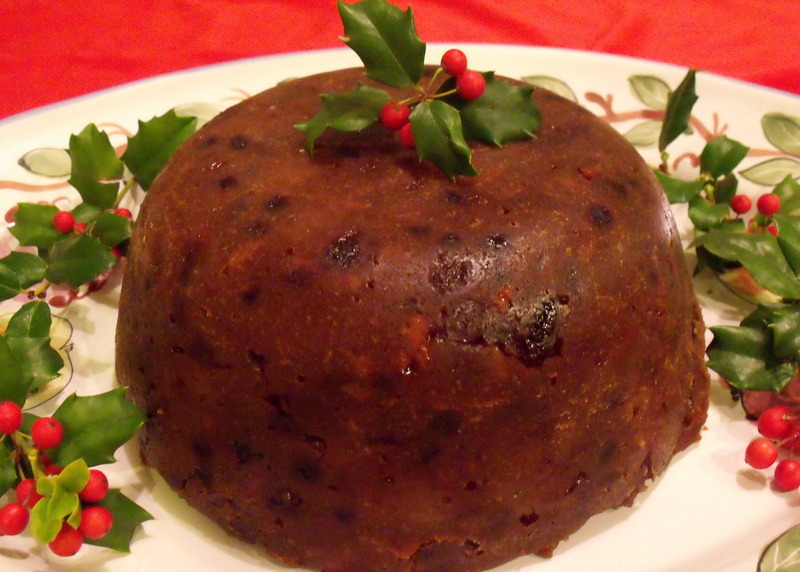 But I have to be careful not to scoff the lot before Saturday morning mayhem starts in earnest. Perhaps I should skip that Friday muffin supper, and just go pack everyone’s kit bags for the morning. Kit bags or a warm, fluffy muffin. Which would you pick? The muffin wins every time for me, because let’s face it, Saturday would not be the same without a little chaos as you munch on a muffin. 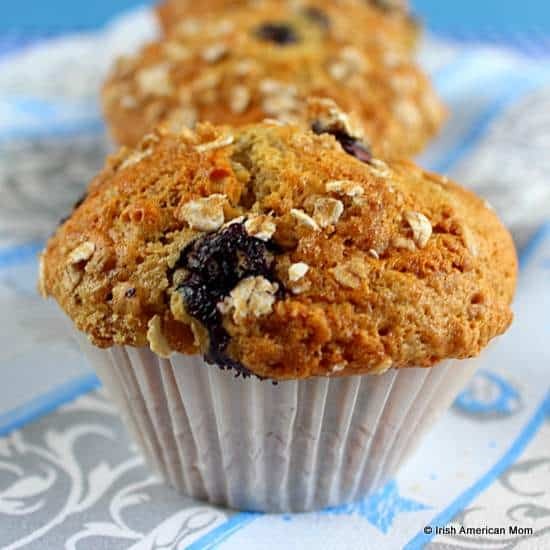 Light and fluffy and full of juicy blueberries these blueberry muffins with banana and oatmeal are the perfect start for busy mornings. Preheat the oven to 350° Fahrenheit. Line a 12-hole muffin tray with paper baking cases. Sift the flour, baking soda and baking powder into a large mixing bowl. Add the sugar and the oats and mix well together. 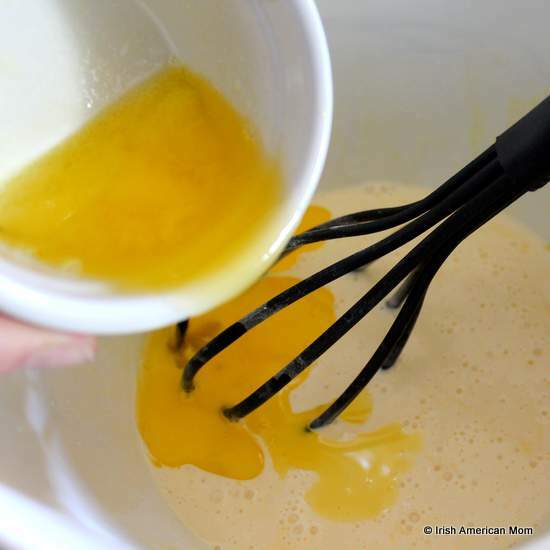 In a separate bowl whisk the eggs and buttermilk together. Then add the melted butter. Mash the bananas and mix through the eggs and buttermilk. Make a well in the center of the dry ingredients. 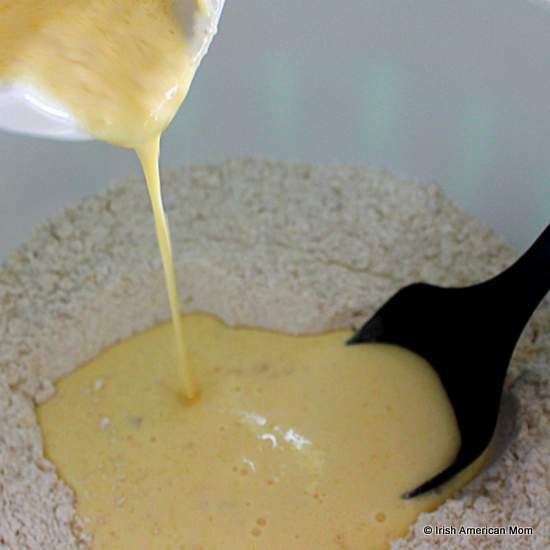 Pour in the wet ingredients and stir together gently to form a loose batter. Do not overmix. 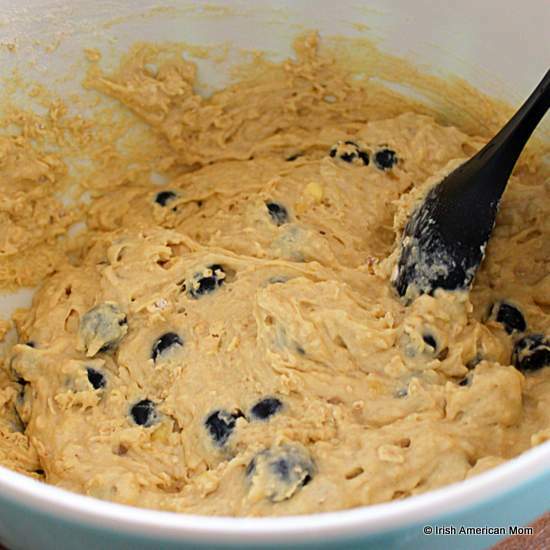 Add the blueberries and mix through the batter gently. Divide the batter between the 12 lined muffin cases. Use all of the batter. Each muffin hole will be fairly full. 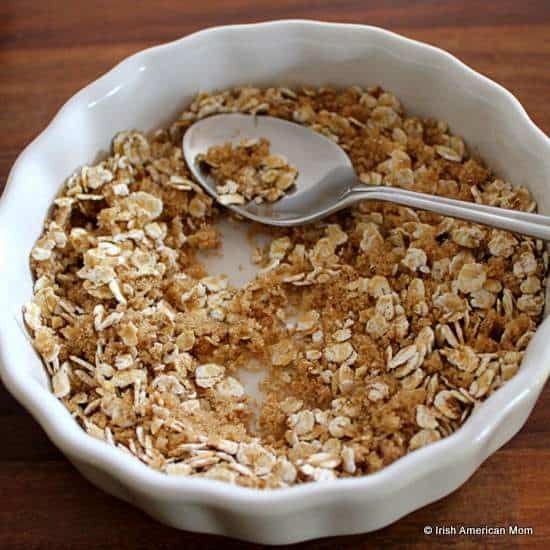 Mix the brown sugar and oatmeal for the topping. Sprinkle on top of each muffin. Bake in the pre-heated oven for 18 to 20 minutes, until the muffins rise and are a golden brown color. Cool for 5 minutes in the tray before transferring to a wire tray to cool completely. 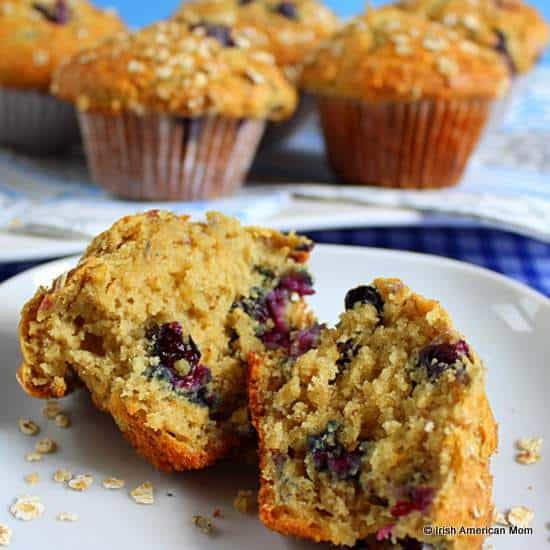 Blueberry muffins with banana and oatmeal mixed through are a satisfying, on-the-go breakfast for busy mornings. Step 1 Preheat the oven to 180° Celsius. 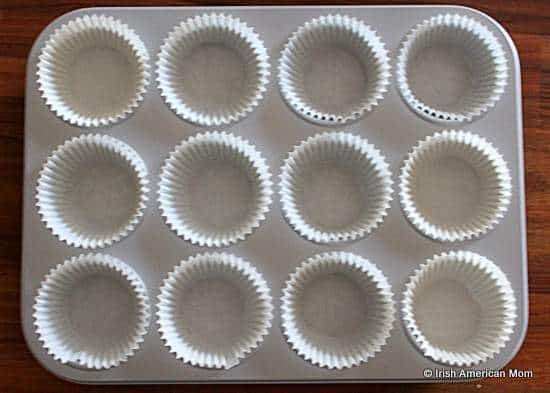 Line a 12-hole muffin tray with paper baking cases. Step 2 Sift the flour, bicarbonate of soda and baking powder into a large mixing bowl. Add the sugar and the oats and mix well together. Step 3 In a separate bowl whisk the eggs and buttermilk together. Then add the melted butter. Step 4 Mash the bananas and mix through the eggs and buttermilk. Step 5 Make a well in the center of the dry ingredients. 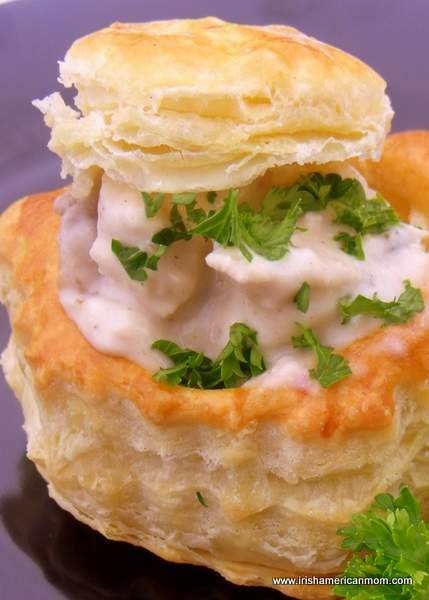 Pour in the wet ingredients and stir together gently to form a loose batter. Do not overmix. Step 6 Add the blueberries and mix through the batter gently. Step 7 Divide the batter between the 12 lined muffin cases. Use all of the batter. Each muffin hole will be fairly full. Step 8 Mix the brown sugar and oatmeal for the topping. Sprinkle on top of each muffin. Step 9 Bake in the pre-heated oven for 18 to 20 minutes, until the muffins rise and are a golden brown color. Step 10 Cool for 5 minutes in the tray before transferring to a wire rack to cool completely. Wishing you all happy muffin baking and munching.